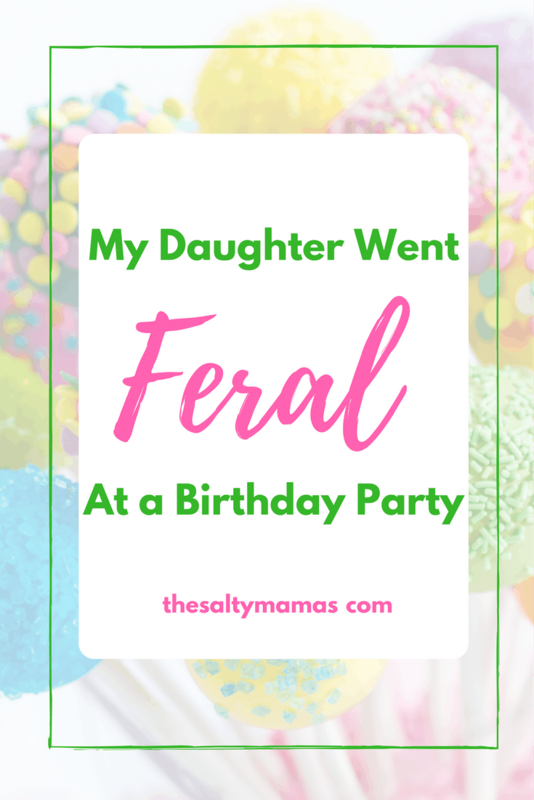 My daughter just went full on feral at a birthday party. One minute, we’re laughing and taking pictures, and the next she’s screaming and clawing and BITING. All because someone “took” the seat she had planned to sit on. I guess I should be grateful she took it out on me instead of the clueless offender, or else I’d never be able to show my face in that circle again. But it’s hard to be grateful for anything when you’re wresting a gnashing alligator that used to be your child in front of a group of people whose opinions and parenting styles you respect. I mean, what the HELL. If she was a dog we’d be talking about whether or not it’s safe to keep her, but because she’s human, I don’t get a say in the matter. I have to keep her. Safe surrender at a fire station is only good for babies up to three days old. Not that I checked or anything. But I don’t have to let her keep her cupcake. That bad boy is going right in the trash. It is quite literally the VERY least I could do, on a scale of cupcake tossing to orphanage, so frankly she should be grateful. Now I’m gonna go nurse my wounds (figurative, luckily, thanks to my seven year career as a bite-dodging-teacher) with a diet Coke the size of my head. Maybe with some vodka in it this time. Children are meant to keep us on their toes! And they are so, SO good at it! Lol I am a couple of years of entering this stage again and not looking forward to it. Good luck during this time! Is it bad that all I can think of right now is that I want that cupcake you threw away? ? No, because ME TOO! I thought about eating it right in front of her but I had already threatened the other thing ? Hahahahahahaha. ahahahahah. Oh jeez. This one made my morning. I am so sorry you had to deal with that! I remember having an epic breakdown in K mart when I was about 5 over a pair of red shorts with a heart shaped belt, but I don’t think I bit anyone lol!!!! Right?? There’s tantrums, and then there’s…well, whatever this was. This is what they call “one for the books” You can tell it at your daughters graduation haha! Ahhh! I’m so sorry but also SO glad I’m not alone! My kids only want to do that type of show in public. Like at sporting events for their older siblings. It is hard when the attention isn’t theirs! Oooh, good point! I bet that’s what brought it on. My girl is a diva ? That is an incredibly difficult situation. I’ve been in that situation more times than I can count with my step-daughter. It makes me want to crawl into a hole and hide. Right?!? I just want to be invisible while it’s happening, but no. It’s HIGHLY visible! Oh my gosh your account made me lol. We’ve all been there. Happily enjoying a get together or an outing or shopping trip and all of a sudden the child loses his ever loving mind and all you can do is scratch your head and go what happened???? Exactly! How did we get here?!? Eek. I’m only in the beginning. He gets so mad if I even have a hint of negativity in my voice. He’s almost 1. For some of them, right? We went through an “I can’t even go out” phase when my daughter was something like 20 months old, but I’m sure crankier about it now that she’s four!